If you want to know where the Good Doctor and his pals go on a Tuesday night between the hours of 7pm and 9pm (UK time), we’ve usually finished our dinner and dropped round to Spiral Wave Radio to visit Jonjo Hall and his fabulous internet blues show. Then it’s down the Tickled Trout for a few light ales and fruit juices. Jonjo, or JJ as we like to call him, is a superbly gifted muso and a great friend of everyone at the Harp Surgery. He spins a blistering line in blues of every possible description, often with a healthy dose of harp, and gives lovely natter with his bezzy mates and special guests. Spiral Wave itself is a cracking good venture – it’s a live radio station run by folks with learning disabilities for the listening pleasure of everyone out there in the community. 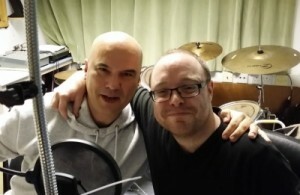 Here are the Doc and JJ enjoying a bit of what does them good in the Spiral Wave studio. If you’d like to join JJ and his pals on a Thursday night, you’ll find them at www.spiralwaveradio.com or you can click the Spiral Wave logo. The Good Doctor had closed the Harp Surgery for the day and was just settling down to a medicinal Jim Beam when the doorbell rang. 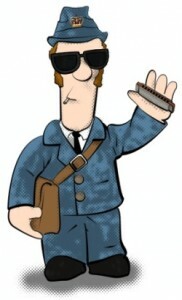 It was Otis the postman with some extra news for blues harp fans. Otis had been messing around with the Internet Radio App on his new bluespad and stumbled across Radio Caprice’s twenty-four hour Harmonica Blues channel. Perfect for after-hours listening at the Surgery. Radio Caprice is a free Internet Radio Station broadcast from Russia and can be located through most Internet Radio search engines. Listeners are treated to the classic tones of masters such as James Cotton, Big Walter, Rod Piazza, George Butler and Junior Wells, as well as one or two very pleasant contemporary surprises. Ron Sorin, The Pera Joe Blues Band and Sven Zetterburg are just a couple of examples the Doc and Otis grooved on down to. Switching to cold shots of Stolyichnaya in celebration, Otis and the Doc stoked the winter coal fire and kicked back for an evening of top class entertainment. David Rotundo’s That Girl had them shimmying like a pair of old hippies on flower power. Nostrovia Radio Caprice!